Well, here it is in all its glory, my Dreaming in Color quilt! 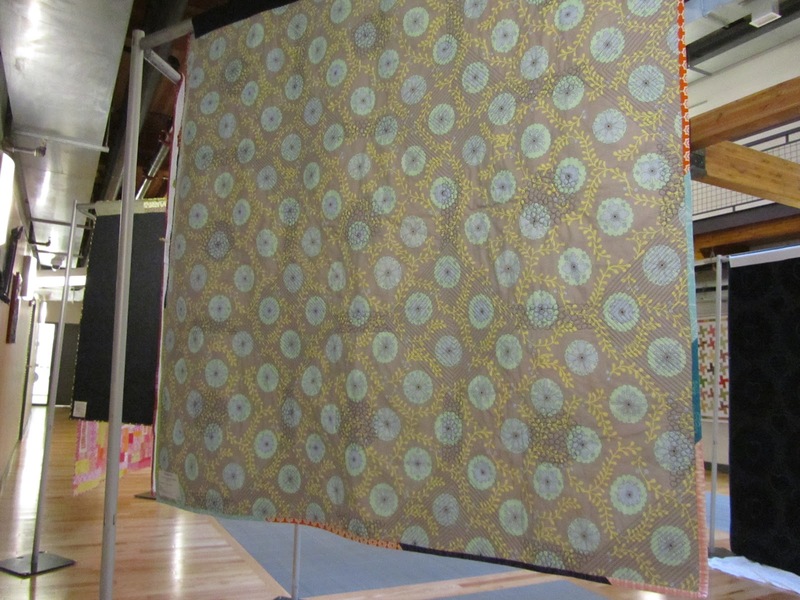 I finished putting the binding and hanging sleeve on the quilt the night before it needed to be hanging for our special exhibit at the Lowell Quilt Festival. If that's not cutting it close, I don't know what is? 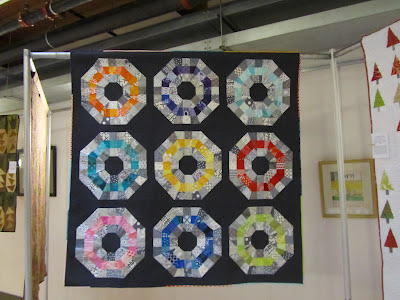 I only had time to quilt the dark grey and not the octagons. 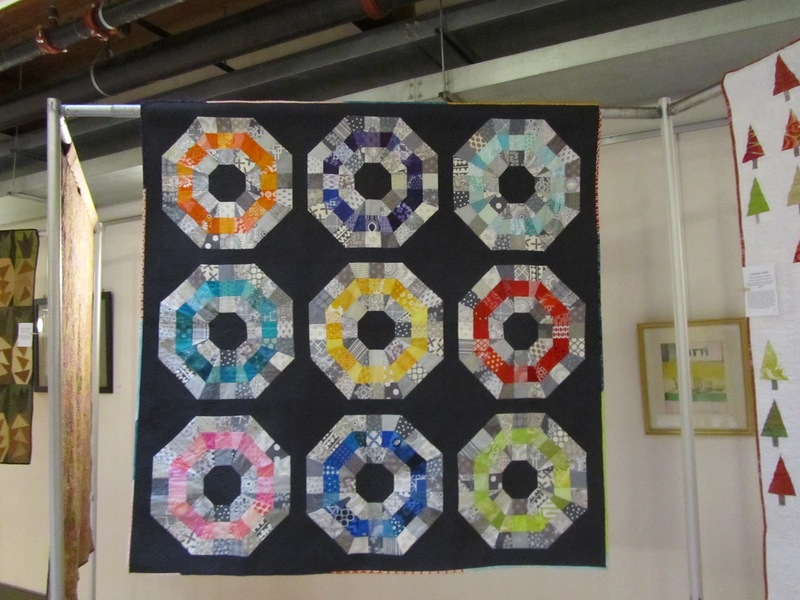 I did some dense quilting of straight lines and pebbles throughout the dark grey. 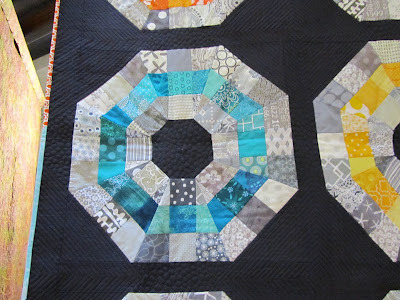 I might go back later and do some quilting in the octagons, but I'm not sure yet. I had originally done a little quilting in one of the octagons, but hated how it looked, so I spent three hours taking it out. Here's the back. It's a print that I got at Marden's for $3.50 a yard. I really love the print, and wanted to use something from my stash, so this is what I ended up using. It's hard to tell from these pictures, but the binding is a bunch of different colors. I think it shows up best on the picture of the back of the quilt. I really like how that compliments the scrappy nature of this quilt. All in all, I'm really pleased with how this quilt came out and I can't wait to find a place to hang it at home. 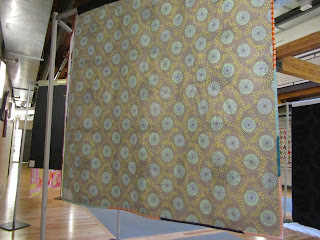 I'll have to get some better pictures once I get the quilt back from the show. Love your quilt. Looks awesome. For the octagons some simple lines/quilting in the ditch might work. Kuddos to you for just an amazing quilt! love the colors in the binding.